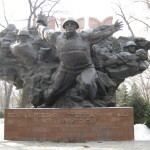 I met with my fellow travelers, a small group of Americans, in Almaty, Kazakhstan to begin my third trip to the five “Stan” countries – Kazakhstan, Uzbekistan, Tajikistan, Kyrgyzstan, and Turkmenistan. 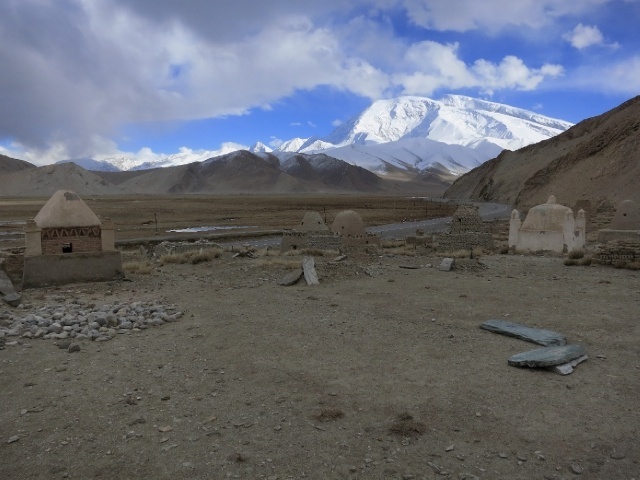 From the rooftop of the world to the vanished Aral Sea, we experienced Central Asia as few others have. I count this as one of my very best trips ever. 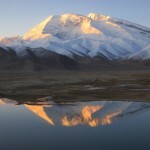 A third visit seemed necessary so that I could comprehend the sheer magnitude of Central Asia. 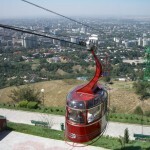 Almaty, nestled in the foothills of the Tien Shan mountain range, is the largest city in Central Asia and the stepping-off point to the other Stans. 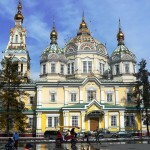 “Almaty” means the place with apples. It is believed to be where apples were first domesticated. It had grown as a major site on the Silk Road but was destroyed by the Mongols in 1211, who eradicated all traces of its ancient history. 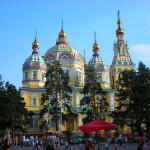 Today Almaty is a modern city made prosperous by oil and gas. Numerous very expensive sports cars line its streets. 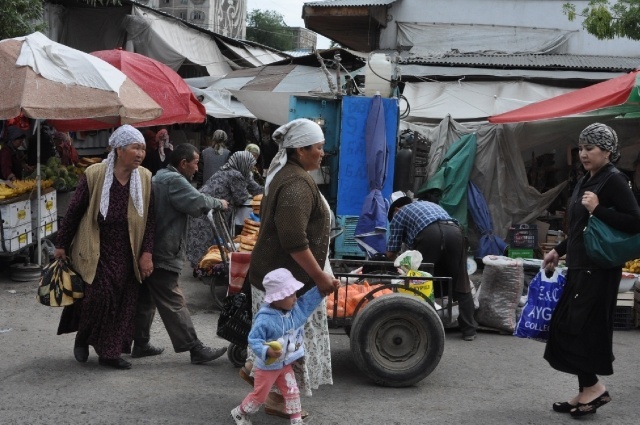 As part of a former Soviet republic, Almaty reflects Russian influences in language, architecture and demographics. What a clean city! I was amazed that streets were washed down nightly and, as we noticed throughout our entire trip of Central Asia, trash and litter were non-existent. With a population of over a million, the city proper is spread out against the foothills. Our sightseeing there included visits to a surprisingly interesting museum of ethnic musical instruments, the beautiful Zenkov cathedral, an impressive, massive World War II monument in the shape of the former Soviet Union with the obligatory eternal flame, a walk through Panfilov Park, and a cable car ride to the top of Kok-Tobe, a 3,800 foot hill featuring a recreation area and with a fabulous view overlooking the city. Before leaving Almaty, we drove into the Small Almaty Gorge, snaking upward to approximately 5,000 feet, where the Medeo Sports Complex is located. Set among the craggy peaks and alpine slopes created by an ancient glacier, this Olympic-size skating rink has seen many world records set and will be the site of the next Asian Games. 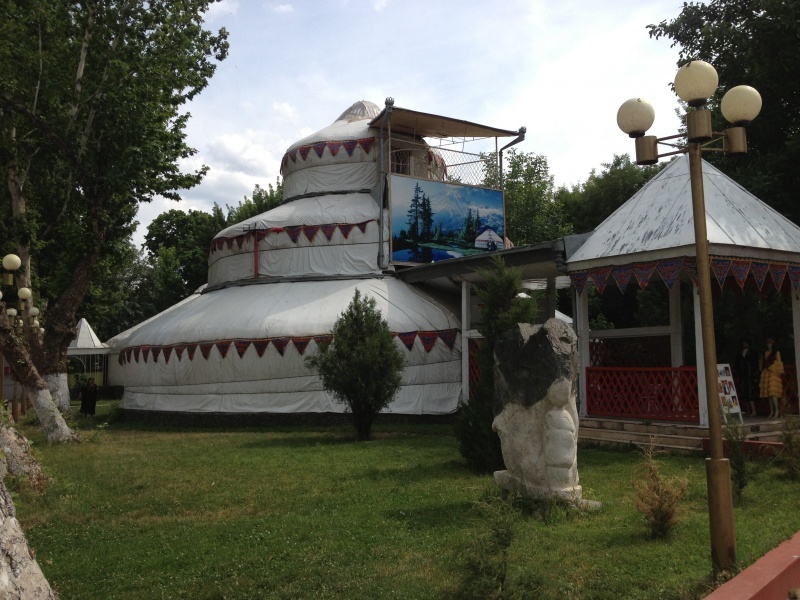 Close to the complex, we had lunch in a traditional Kazakh yurt restaurant before setting off to Bishkek, the capital of Kyrgystan. After a drive of several hours and a border crossing, we arrived. We were immediately impressed by the abundance of trees in the city. At dinner that evening in a local restaurant, we were treated to a performance of Manas, a dramatic song that celebrates the history of the nation. The full version of the song could last 3 days. We were lucky to have one of the best Manas’ singers in the country for our private performance. 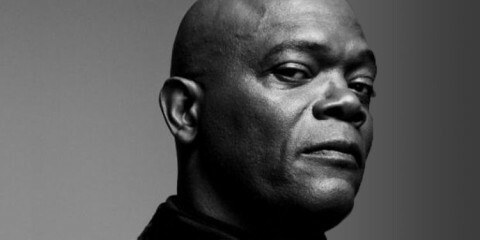 I thought my water glass would shatter from his voice. We spent the following day visiting museums, walking through a park, participating in felt-making, and watching rehearsals for an upcoming military celebration – an accidental, unplanned event we happened to come across. That evening, we had the incredible experience of dinner in the home of the mother-in-law of Paul, our tour manager. It was a huge feast including many exotic items and vegetables from her garden. 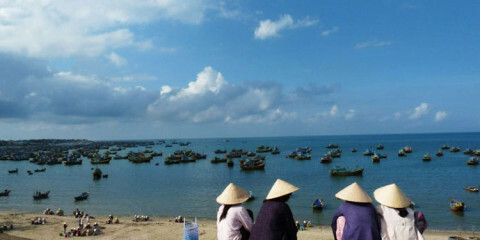 MIR tours’ trips regularly include dinners in local homes, one of the reasons their trips are so exceptional. 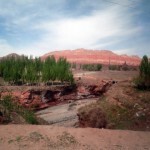 The following day, we flew to Osh, located in the south of Kyrgyzstan. 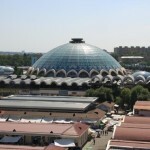 It is the country’s oldest and second-largest city, set in the fertile Fergana Valley. 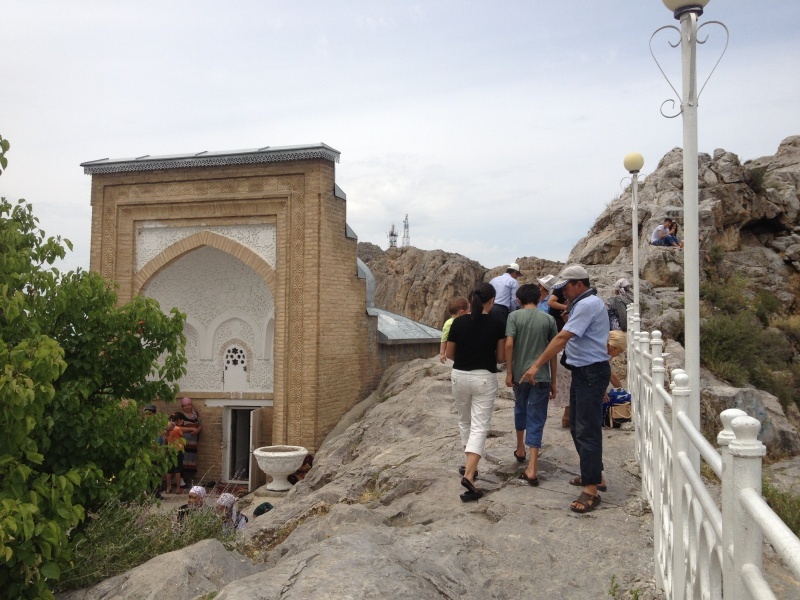 We were the first MIR group to visit Osh since ethnic rioting in the spring destroyed many Uzbek neighborhoods. 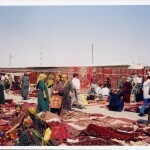 It was a center of silk production along the old Silk Road and celebrated its 3,000th anniversary in 2000. 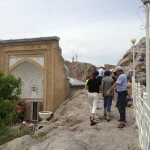 There we visited the sacred throne of Suleiman the Magnificent, a huge limestone and quartz mound with a view of the city. It is full of caves, some of which are now used as a museum, and has recently been declared a UNESCO World Heritage Site. 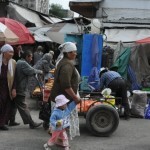 We also visited the local market which had just reopened after the recent rioting. 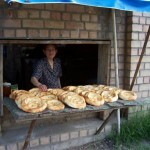 After lunch in a restaurant, we headed overland to Sary Tash, a small village in the southeast point of the country. This drive gave us our first taste of the mountainous terrain we would be traversing for the next several days. 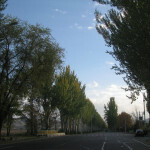 Around Osh, the countryside was heavily agricultural and dotted with small villages. Many times, we had to slow to a crawl for the small herds of cows and goats in the road. 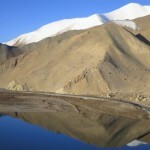 Eventually, this became less and the terrain became hilly, sparsely populated and rugged as we approached the Pamir Mountains. 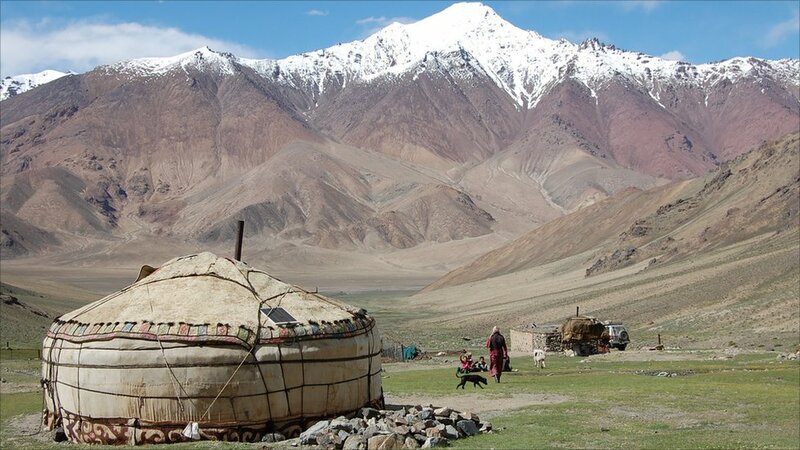 Sary Tash is a collection of small houses and yurts close to the border with Tajikistan. It sees few tourists. 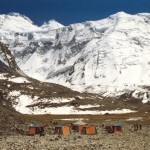 Its only accommodations are a few yurts with pads on the floor for sleeping, lighting from bare bulbs powered by a generator, and an outhouse a small distance away. 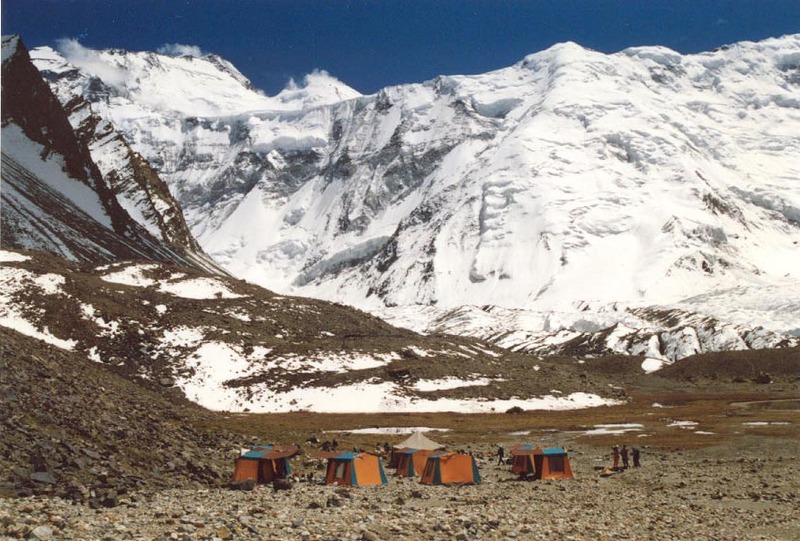 Temperatures were cold and food was very basic, emphasizing that we had left the comforts of the beaten path behind, entering a world with rough conditions that few Americans can imagine, seeing a world that very few Westerners have visited. It was often uncomfortable, the food was occasionally inadequate and the conditions extremely basic, but it was magical. After our somewhat uncomfortable night in Sary Tash, we drove on the rough, mostly unpaved road to the border post where I experienced the funniest moment in all my years of travel. We disembarked from our van to stretch our legs while Paul went inside one of the buildings with the officials. We waited. And we waited. 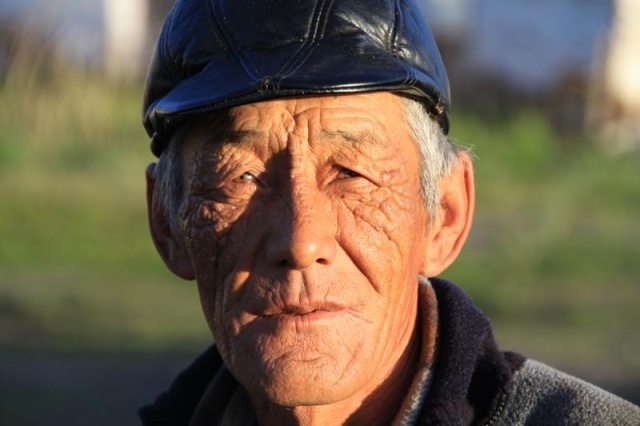 More than once, I saw Paul, our local Kyrgyz guide and the outpost’s commander move from one building to another and back. The look on Paul’s face did not inspire confidence. After a time, our driver moved our van back outside of the post’s gate, which was then locked in front of him. This was not encouraging. Finally, Paul came out to inform us of the situation. With the recent governmental instability, the country did not seem to have anyone in charge. 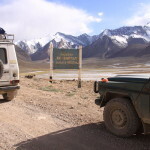 It had been impossible to obtain the paperwork allowing our Kyrgyz driver (an ethnic Uzbek) and van to carry us across the ten-mile no-man’s-land separating the two countries’ border posts. If our driver had been an ethnic Kyrgyz, he most likely would have been allowed to drive us across the border after a baksheesh handshake. The commander offered to transport us in an army vehicle for the outrageous fee of $50 per person. Paul had bartered this down to $200 for all 7 of us, but when he explained how this was to be done, we were incredulous. It was patently impossible. All 7 of us, our luggage, the commander and a driver would make the trip in a small Russian Jeep-like vehicle that could comfortably carry 4. There was no way that this would work. It was completely impossible. But, after several tries, all of our luggage somehow ended up crammed into the small space behind the back seat. I still don’t know how that was accomplished. Then the commander placed a tiny stool between the two front seats, where Paul perched with his legs scrunched against the gear stick. The remaining 6 of us crammed ourselves sardine-like into the back seat without a cubic inch of spare space. A couple of people promptly lost circulation in their legs due to people on top of them. We all were in strained positions unable to shift at all, jammed up against Paul so that he was as uncomfortable as we were, and everyone was hunched, scrunched and barely able to breathe. The commander and the driver occupied the two front seats, with plenty of room and richer by $200. The drive was very slow, over rough, rocky road, across a riverbed, up and down steep rises, bouncing and jostling and seeming to last forever. Each bounce hurt more than the last. I couldn’t stop laughing. Fortunately, other members of the group reacted in the same way. We had never done anything so ridiculous, so impossible and so hilarious before. We laughed until tears came, though some of those tears could have been due to the pain of strained, bloodless limbs. 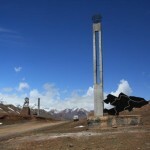 At long last, we reached the Tajik border post. As soon as the vehicle came to a stop, we exploded out of it like circus clowns, still laughing and knowing that we would never forget that ride. As far as travel experiences go, it was priceless. We were met by two 4-wheel drive vans and their astounded drivers. 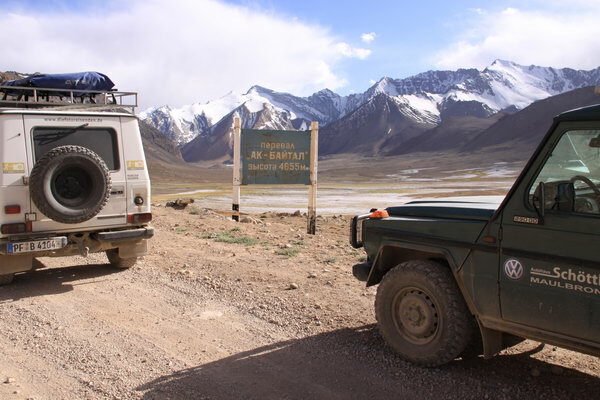 We loaded up, in much more comfort, and set out on the Pamir Highway. 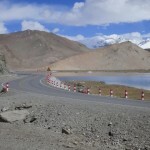 It is a highway in name only, a narrow, often one-lane road, mostly unpaved, that winds its way through incredible scenery. 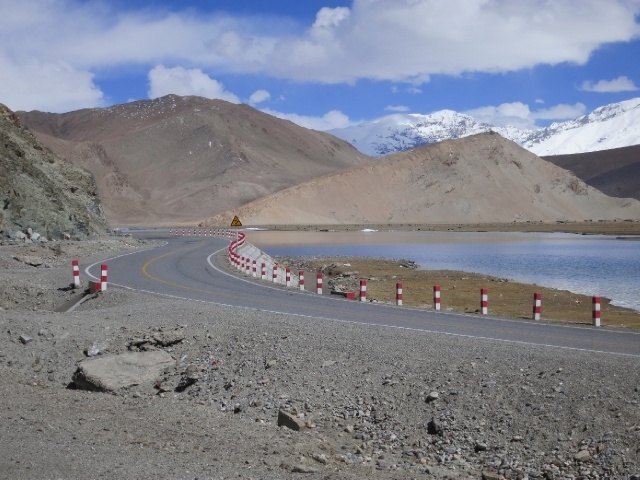 We needed special permission to take this “roof of the world highway.” For many miles, it paralleled the Chinese border, marked by a continuous “electric” fence that had been built by the Soviets. We wound between mountains, eventually climbing over several high passes, including the highest at 14,000 feet, the Kyzyl Art Pass. For most of the day-long drive, we were alone on the road, only occasionally meeting or passing huge Chinese trucks carrying goods to other parts of Central Asia. This area is very sparsely populated, with only a few small villages scattered through it. 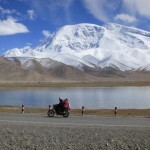 We reached one of these, near the beautiful, pristine Karakul Lake, around lunch time. We were able to obtain a lunch that would at home have been considered inadequate but to us, especially looking back on it after some of the other really bad meals we had later, seemed quite good. After an afternoon bouncing through more amazing scenery, we eventually reached Murgab, the “city of birds,” a town of about 4,000 people and second largest town in the Gorno-Badakhshan Autonomous Region, a piece of disputed territory in the mountainous northeast corner of Tajikistan. 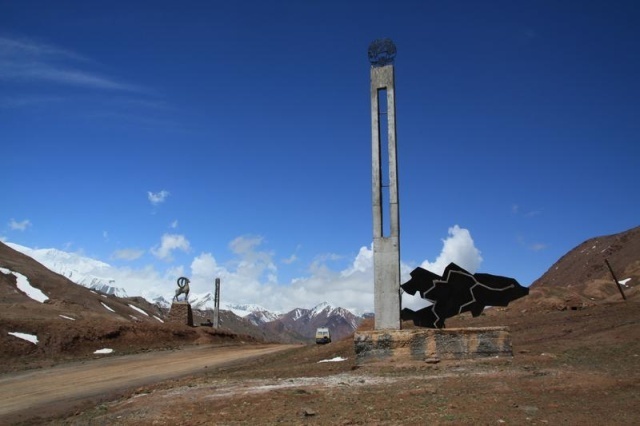 Murgab is the highest town in Tajikistan, sits at the junction of three major roads and has long been a melting pot for the many ethnic groups in Central Asia. 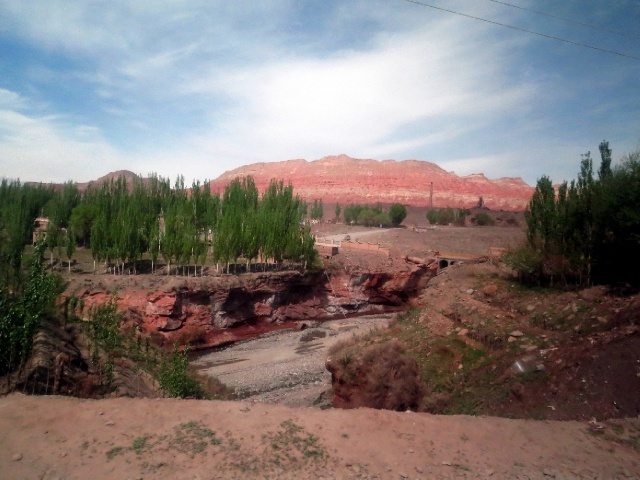 We stayed in the best accommodations available in Murgab, a guesthouse, for two nights. 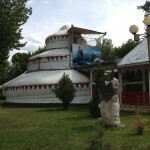 Typical of guesthouses in Central Asia, this was a home that takes in travelers. It was a collection of a home and several outbuildings clustered around a small dirt courtyard, all enclosed by a fence with a heavy gate. The house had a few rooms, each with multiple beds for travelers, and the family’s living quarters and kitchen. There was no running water. Electricity was available for brief intervals in the evening. The outbuildings included an outhouse and a sauna where we were able to take bucket baths with its hot water. Also in the courtyard was an oven where the woman of the house baked bread every few days. Food there was basic and not particularly good. This guest house was “the real deal,” and certainly for everyone. 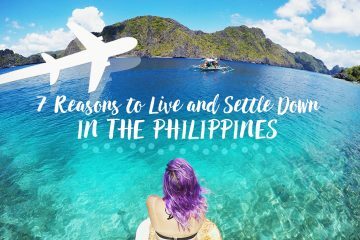 Our little group accepted and embraced the inconveniences and discomfort, knowing that we were experiencing the reality of life in that part of the world and that we could not experience the wonder of the area without enduring the hardships. We spent the day driving out of the town up into a valley between two of the many mountains, climbing higher and higher with each mile. 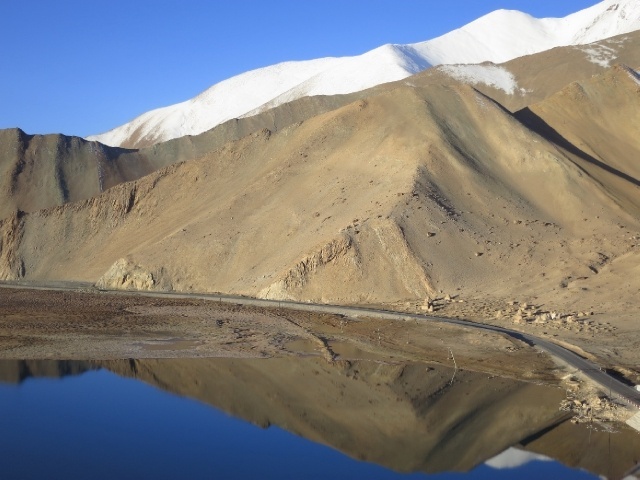 We experienced what would be true for the next few days as we continued on the Pamir Highway: incredible scenery that can’t be properly described. It left us amazed and filled with awe at the sheer majesty and immensity of the landscape. 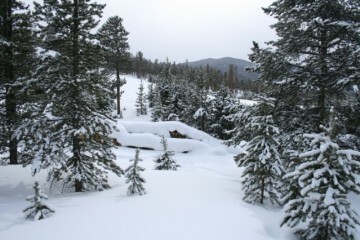 Many peaks were snow-covered. All were astoundingly dramatic, with variations in color and texture that overpowered our senses. It would be a geologist’s dream. Layers of rock in different colors were pushed up, twisted and tilted, stabbing the sky. Combined with afternoon shadows, the effect struck us as reminiscent of the background in Edvard Munch’s painting, The Scream. We were awed and humbled, very aware of our own insignificance. When we reached a point where the road had been washed out, we continued walking and climbing as far as we were able to go, eventually turning around when it began to snow lightly. After returning to Murgab mid-afternoon, we visited the local market and a cooperative that sells handmade items to the few tourists that reach this remote spot. 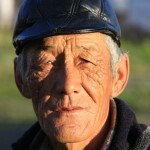 We were struck by the varied ethnicities of the people we met. 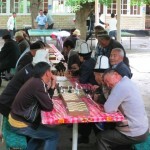 Though we were in Tajikistan, a large number of the inhabitants of Murgab are ethnically, and obviously, Kyrgyz. Stalin had arbitrarily drawn borderlines that carved up the area into the nations now on the map, with no regard to traditional boundaries or ethnic reality. By chance, this was the first day of school. We were struck by the children, all dressed in black and white finery. Some of the young girls looked almost like they were dressed as French maids, with black dresses and white, frilly aprons. This black-and-white attire turned out to be common with schoolchildren throughout the 5 Stans. Most of the girls also wore frilly white pompom-like hair accessories. They were beyond cute. 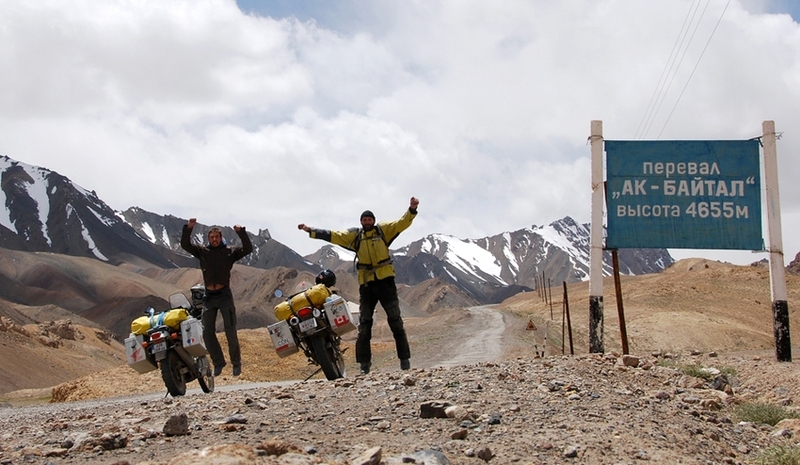 The following day, we continued bouncing and crash-banging along the Pamir Highway, eventually reaching the 15,270 foot high Ak-Baital Pass. The scenery continued to be stunningly breathtaking. This day was much like many of the days to follow, long days of driving on incredibly bad, dusty roads through some of the most fantastic scenery imaginable. Finding words to describe these drives is impossible. Simply put, we all agreed that these were some of the most amazingly scenic drives we have ever taken. They were long, dirty and bouncy. There were very few habitations along the way and even fewer places where it was possible to get a much-needed bite to eat. But we hardly noticed the inconveniences. 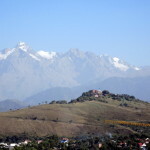 Our senses were overwhelmed by the ever-changing views of peaks, valleys, narrow waterfalls, vegetation, colors and textures that we experienced as we climbed slowly up and down the narrow roads snaking through the mountains. 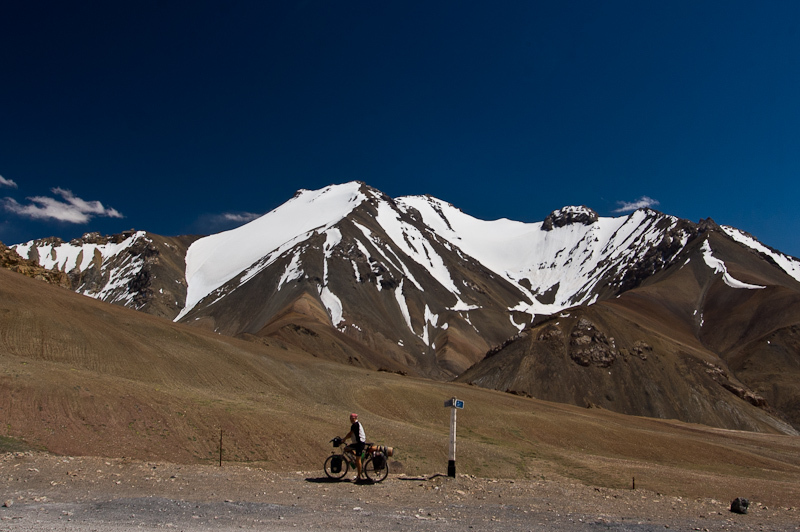 The Pamir Highway is all the more fantastic because it is so inaccessible, so pristine and so difficult to get to and to travel on. 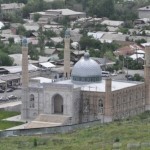 Eventually, we arrived in the city of Khorog, the capital of the region, where we spent two nights. 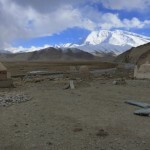 Khorog is located in one of the poorest areas of the Pamirs. 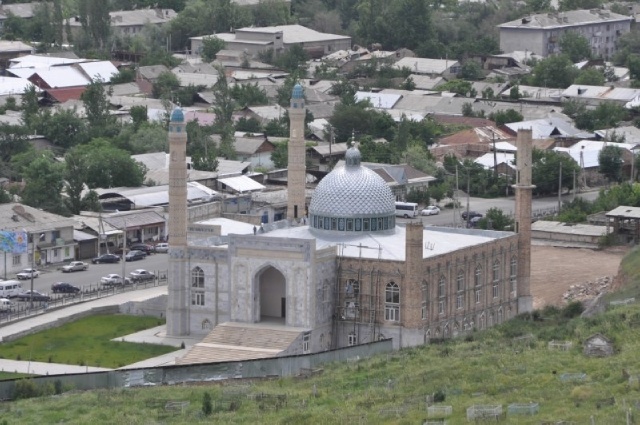 In spite of that fact, it is a thriving city and home of the Central Asian University. The University is underwritten by the Aga Khan Foundation, which also supports many other businesses and charities in the area. Our hotel, the Serena Inn, was refreshingly nice by any standards. It had been built by the Aga Khan on the bank of the Pyanj River with a view of Afghanistan on the opposite bank, perhaps only 50 yards away. 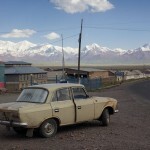 We spent a full day seeing the sites of Khorog, including the world’s 2nd highest botanical garden and the first motorized vehicle to traverse the Pamir Highway in 1932, a small pickup truck displayed at the edge of town on a large concrete block. Before departing from Khorog, we stopped at the Afghan market where Afghanis gather to peddle their wares, some handmade goods but many more items manufactured in China. We spent the next two days climbing over more mountains on some of the roughest, dustiest roads in the world. All of the first day, the road snaked along the Pyanj River, the natural border with Afghanistan. The drive was grueling but worth every bump, cloud of dust and bit of bad food that are integral to the experience. 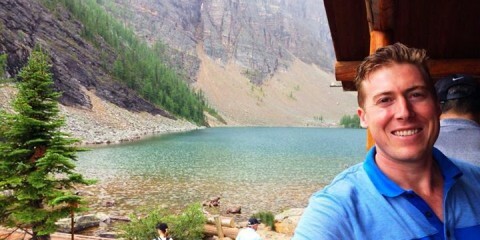 The awe and wonder we felt as we absorbed this majestic, unparalleled, pristine beauty cannot be adequately expressed. The scenery was continuously changing, from one spectacular view to another as we wound our way carefully on the narrow roads, sometimes with only a couple of feet to spare as sheer cliffs dropped away on one side with the mountain wall mere inches from the other side of the vans. Narrow footpaths zigzagged up the steep slopes, interrupted often by rubble from landslides. Frequent waterfalls, narrow but very tall, dotted the view. All of the very few tiny settlements are situated alongside these water sources, perched on a few small flat spaces of land alongside the road. To me, life in these locations appeared little above that of a caveman. Except for the road itself, we went long distances without seeing any signs of human presence. One exception was a Russian tank that had been pushed off the road during the war for independence, now rusting under a bridge high in the mountains. As night began to fall we left Khorog, arriving at the little village of Kalaikhumb where we were fortunate to stay in a guesthouse supported by the Aga Khan Foundation. It was very basic in every way, but due to the Foundation, it was updated in ways other guesthouses in the region are not. It had electricity, its courtyard was cement rather than dirt and it boasted a real bathroom with a flushing toilet and a tub with hot, running water. As usual, these facilities were located across the courtyard from our second-floor guest quarters. We did not at all mind the trek it took to get to them, even in the middle of the night. Towards the end of the next day, after hours of more incredible scenery, we eventually found ourselves out of the mountains and on real roads as we approached Dushanbe. While still outside the city limits, we stopped to pay local boys to wash our vans with buckets using water from a small stream. Dirty vehicles are ticketed in Dushanbe so several groups of boys perform a car cleaning service for a small charge. Before the wash, our vans could not have been dirtier. Then we experienced the shock of returning to civilization with its traffic and crowds of people. 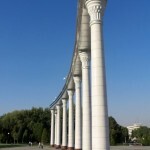 We eventually arrived at another shock, the 5-star Hyatt Regency in Dushanbe. After our rough accommodations on the road, this was mind-boggling, one of the nicest hotels I have ever stayed in. Since we could have grown crops in the dirt and dust we had on our bodies and our luggage, we seemed very out-of-place checking into this posh, ultra-modern and luxurious establishment. A hot shower soon had us feeling quite comfortable and ready to enjoy being pampered. 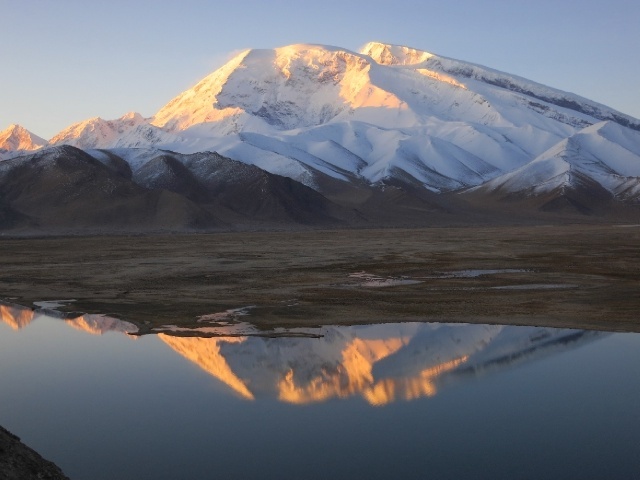 We were bemused by the contrast between sleeping on the floor of a yurt with no running water at one end of the Pamir Highway and ending up at the other end in a true 5-star hotel with all the amenities, even a lap pool. We spent 2 very decadent nights there while we explored the sites of Dushanbe, feeling that we had earned the right to enjoy the upgrade. 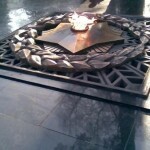 Leaving Dushanbe, we spent all day first flying to Khujand and then driving across the border to Samarkand, Uzbekistan. Crossing the border was the usual ordeal in this part of the world, with us hauling our luggage across wide expanses of no-man’s-land, multiple copies of Customs declarations to complete and the repeated examination of all our documents on both sides of the border. 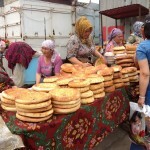 We spent two nights in Samarkand, a bustling city with much history and many sites to see. 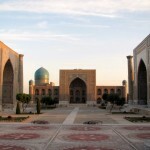 These included the Registan, considered to be Central Asia’s “noblest public square,” bounded by an incredible collection of Timurid architecture, and the Bibi Khanum Mosque, built by Tamerlane to be the largest mosque in the Islamic world. 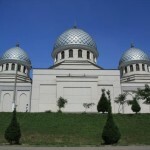 Architects from India and Persia, with the help of almost 100 elephants, constructed the mosque using Indian marble. 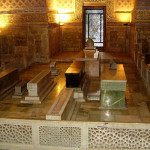 We also strolled through the fascinating Shah-I-Zinda, a collection of tombs and mausoleums, and visited Gur Emir, the location of Tamerlane’s tomb. 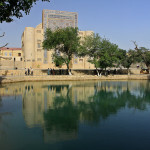 On the 16th day of our trip, we traveled by bus west to Bukhara, an ancient Silk Road oasis for camel caravans. 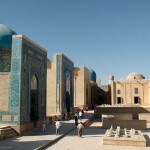 Uzbekistan differs from the other countries of Central Asia in that it contains numerous very old cities. Bukhara itself was built up by Tajiks/Persians, not Uzbeks, and today is still predominately populated by ethnic Tajiks with Uzbek passports. The ancient architecture and design in Bukhara has been preserved better than in other places, despite being heavily bombed by the Bolsheviks, resulting in a charmingly lovely and exotic city. We visited the Zindan Prison with its infamous “bug pit” where two British spies were brutally imprisoned in the 19th century during the struggle between Britain and Russia for influence over this strategic oasis. 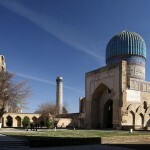 We saw the Kalon Mosque and Minaret, the second largest mosque in Central Asia. Its minaret is ringed by 14 unique bands of brickwork and was the only structure to survive when Genghis Khan raised the city. We stayed in a delightful B&B, Sasha & Son, a “boutique hotel” in the old Jewish Quarter. It had been fashioned from several old Jewish merchant houses and decorated in the national style. It was easy to walk from the hotel to Lyabi-Hauz Plaza, the central pond and meeting place of the old city, where we found an amazing array of unique handicrafts and unusual ethnic items to satisfy even the most avid shopper. 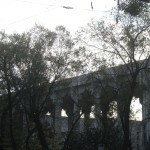 Paul told us that this is the one place where tourists often realize that they did not bring enough cash. After our pleasant stay in Bukhara, we spent another day traveling, first driving to Turkmenabat, Turkmenistan (our fifth Stan) with the usual border crossing ordeal, then flying on to Ashkhabad. 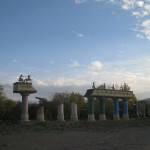 Ashkhabad was another city that had resisted the Mongols in the 13th century and been destroyed. In 1948, a massive earthquake ravished the city, killing over two-thirds of its population. 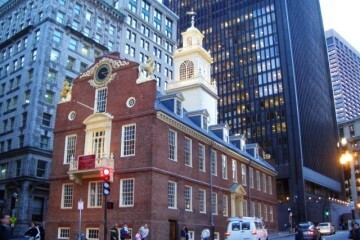 Lately, it has seen a major building revival. It has changed dramatically since my previous visit over a decade ago, reminiscent of the building explosion in Dubai. Ashkhabad feels like a mix of Pyongyang, Brasilia, Dubai and Canberra. The look of the city is ultra-modern and spare-no-expense, though most of the luxury apartments and fancy hotels seem to be unoccupied. Huge parks and statues complete the picture of a country suddenly dripping with natural gas revenues. Fortunately, we were able to visit a local market outside of the city for a taste of reality. 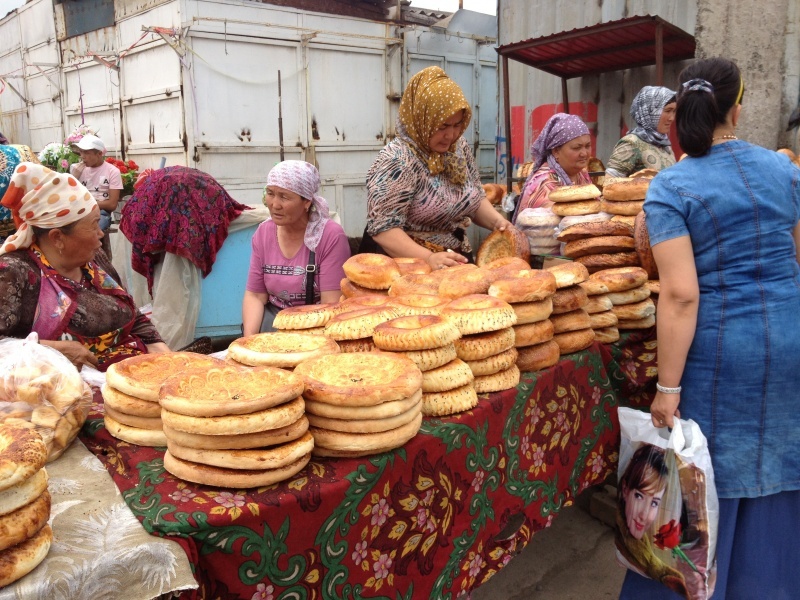 The Tolkuchka Bazaar is one of the most exciting open markets of Central Asia. Its name literally means “lots of elbowing.” In spite of the huge crowd of people, we enjoyed experiencing a market that has been attracting merchants and shoppers from all over the country for hundreds, maybe thousands of years. 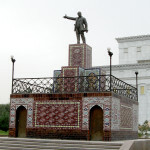 In town, we toured the Lenin Monument, the incredibly lavish mausoleum of Turkmenbashi “the Great,” which is modeled after Napoleon’s mausoleum, located next to a sparkling new mosque, an eye-popping showplace rather than a dedicated place of worship. Our trip “officially” ended in Ashkhabad. 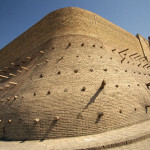 However, some of us stayed on for an extension starting with a return to Uzbekistan for a one-night stay in Khiva. 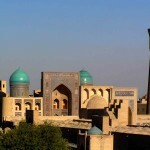 Legend has it that Khiva was founded by Shem, Noah’s son, at the spot where he discovered water in the desert. 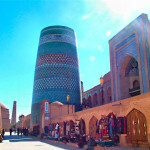 Khiva is a living museum including the Dzhuma Mosque with its 115 carved wood columns that create a forest-like effect. Four of these columns, older than the rest, show fire damage, supposedly from Genghis Khan’s torching of the city. The next day we drove to Nukus, the capital of the autonomous region of Karakalpakia (or Karakalpakstan) in western Uzbekistan. 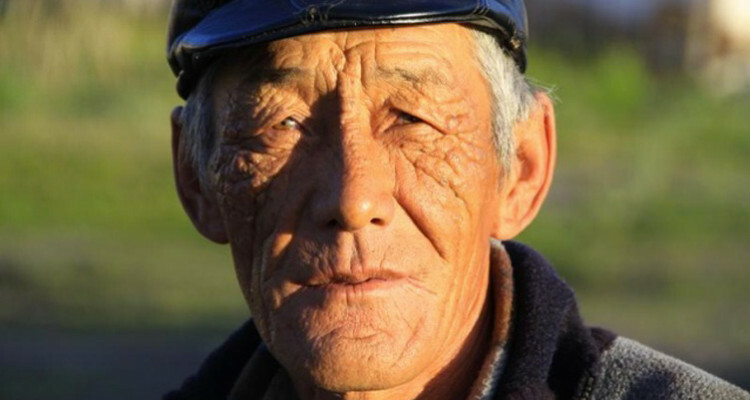 The Karakalpak people are more closely related to the Kazakhs than to the Uzbeks, with a mix of Mongol bloodlines. 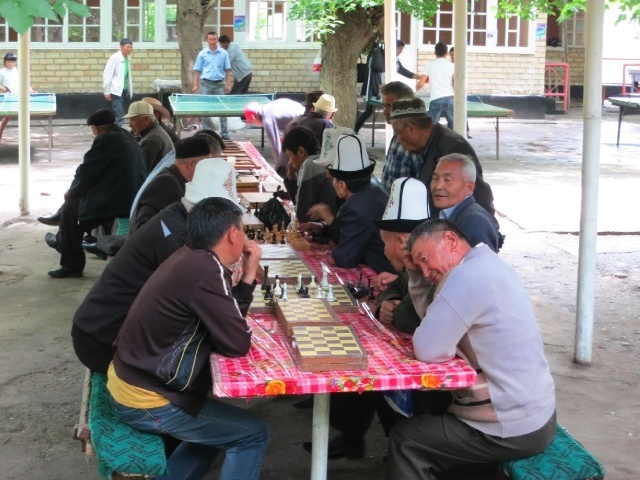 Nukus sits at the center of an area crisscrossed by old caravan routes and dotted with ancient ruins. 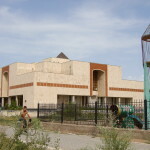 Its claim to fame is an amazing thing to find in such a remote area, the Savitsky Art Museum, the “Louvre of the desert.” It is famous for its huge collection of avant-garde Russian art. Igor Savitsky had amassed this collection, much of it banned by the Soviet regime and smuggled out during Stalin’s leadership. It is an astonishing world-class collection of incredible art of all mediums, well worth the ordeal of getting to Nukus to experience. However, for us it was an added bonus. 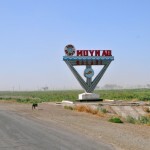 Our main objective in coming to Nukus was to take an all-day bouncy trip to Muynak, once a thriving fishing port on the Aral Sea and now not much more than a ghost town. 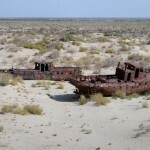 We wanted to see the remains of the Aral Sea, formerly the fourth largest inland sea in the world. It barely exists today after the Soviet diversion of its two feeder rivers, the Amu Darya and the Syr Darya, for agricultural irrigation. Muynak is now hundreds of miles from any remaining water, which is too salty to support life. The magnitude of this ecological disaster is impossible to comprehend. We spent time walking on the sands that used to sit under some 40 or 50 feet of water, among the rusting hulks of old fishing boats and freighters. It was an eerie experience that I won’t soon forget. 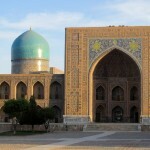 Finally, we flew to our final city, Tashkent, the capital of Uzbekistan. This is a lovely, modern city located at the foot of the Tien Shan Mountains, like Almaty, where we began this adventure three weeks prior. It dates back to the first century BC. 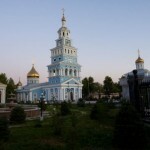 Unfortunately, most of its historical architecture was destroyed in a massive earthquake in 1966. Now, wide tree-lined boulevards flanked with name-brand western stores are interspersed with beautiful parks, fountains, monuments and statues. It is truly an international city. We wished that we would have had more time to explore it properly and see more of its sites. In retrospect, this amazing overland trip across the 5 Stans was not only one of extreme contrasts but of learning as well. The experiences we had, the cultures we met and the vast scenery we traversed gave us a perspective on man’s origin and his adaptations for survival. We got a taste of how little people need to live simply and how difficult it is to live directly from the earth. 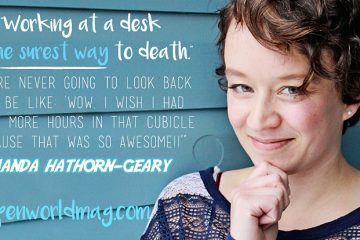 We were reminded that most of the world does not live in the fast-paced, convenience-filled style that we are accustomed to. It was humbling. It was not a trip for inexperienced wimps. 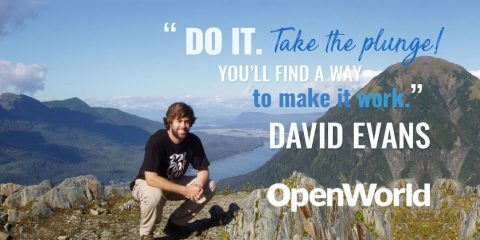 However, if you can handle roughing it at times, have been jaded by easier travels and want to see some of this earth’s most awe-inspiring, dramatic and pristine scenery, it might be for you. Be sure to bring toilet paper, antibiotics, chewable peptoids and, if you like shopping for exotic, beautifully made handicrafts available nowhere else, much more cash than you think you will need. 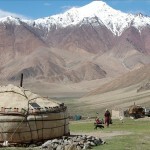 If you have not seen Central Asia, you are missing a huge chunk of the history, culture and natural beauty of this earth. 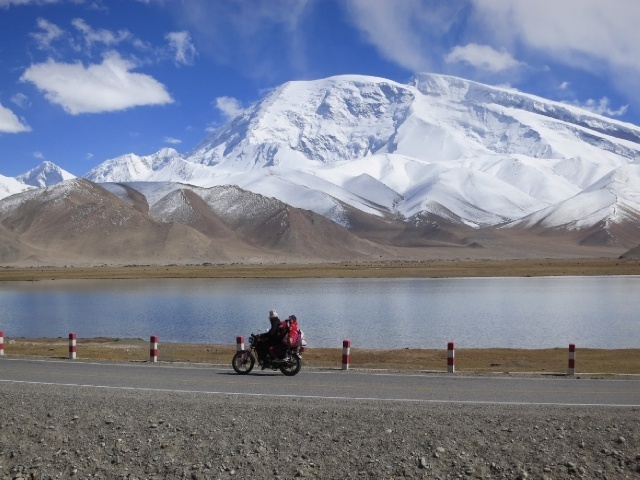 And for true, unparalleled majesty and beauty, you can’t beat the Pamir Highway. This turned out to be the most in-depth, contrasting trip of all, arranged by MIR Corporation in Seattle. As always, their diligence and attention to detail helped create yet another trip of a lifetime.